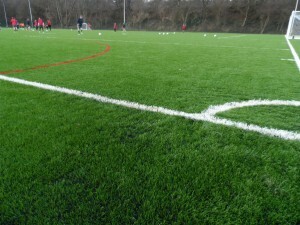 There are many different factors that can determine the cost of an artificial 3G synthetic pitch. Aspects such as sizes, dimensions, specifications, designs and location can all determine the final costs of the MUGA surfacing. These types of surfaces can be built in schools, parks, sports clubs and roof top terraces and even the area location will have an effect of the playing surface. 3G pitches are a 40mm + synthetic turf that looks and feels like a natural pitch when played on. Sports like Rugby, Hockey and Football can be played on the surface and the facility can have sports fencing and sports floodlighting installed to help generate extra income. We are a contractor who specialise in this area. The pile weight and height can also affect the cost of the third generation rugby surfacing as it is normally supplied and installed to a 50mm or 60mm astroturf height in order to suit the play characteristics of rugby. The 3G artificial turf is available in a variety of different designs and specifications to suit other sports such as hockey and football and enhance the use of the synthetic grass pitch. The cost may also be affected by the type of grass selected. We offer a monofilament and fibrillated 3G surface which can alter the specification and type of maintenance needed after installation. From specifications, designs, budgets / funding, costing, pricing and quotations, we can help in your project. Please visit our website on https://www.sportsandsafetysurfaces.co.uk/ or fill in our contact form to speak to our team.